Soon I assure you planting season will be among us and I should have some news to share with you but first we must have St. Patrick’s Day and my oldest 5th birthday party. A birthday party is hanging heavily on my mind right and getting everything planned just right for that but I knew I had to share at least one St. Patrick’s Day recipe. So thank you to Mama Loves Her Bargains who posted this Cupid’s Crunch recipe because I knew I could easily adapt it for St. Patrick’s Day. Luck Of The Irish Crunch is so versatile for any holiday. Use pale pink, yellow and green for Easter. Red, White & Blue for the 4th of July. Black and orange for Halloween. You get the point of how versatile this crunch is. Not only is it versatile in the colors that can be used but the ingredients are are pretty versatile. I really was wishing I had some peanuts on hand but I can guarantee there will be other opportunities to give that a whirl. This time around I used Reese’s Pieces candy but M&M’s would work like a charm as well. 1. Get a big bowl. Your going to need it. 2. Cover a cookie sheet with parchment paper or wax paper. Set aside. 3. Combine popped popcorn, rice chex, pretzels and Reese’s pieces in your big bowl and set aside. 4. Melt 12 ounces of Wilton Green Candy Melts in the microwave in 30 second intervals until melted thoroughly. I had to add 1 tablespoon of shortening to my melted chocolates because they were pretty thick and I wanted to them to pour. Make a judgement call here if the melted chocolates will “run” off your spoon they are good without the shortening. 4. Pour your melted candy melts over the top of your chex, pretzel, popcorn, Reese’s mixture and mix it up to make sure everything is coated. 5. Spread your mixture out onto your covered cookie sheet and allow to cool. 6. Once your mixture has completely cooled you can break into pieces to put into your kids lunch, snack time, or to feed a party crowd with. 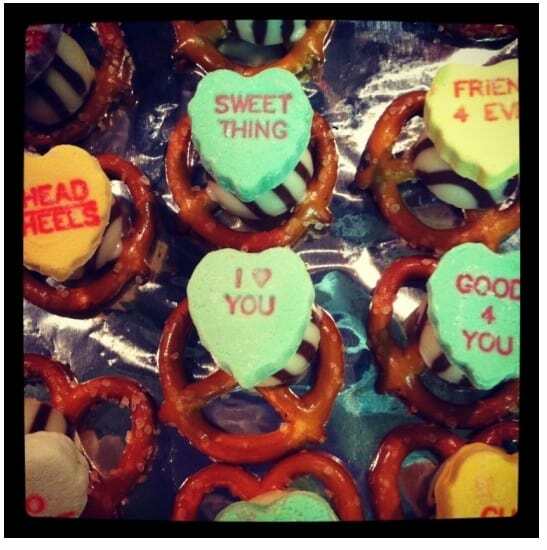 My favorite part is the Chex and my husband loved the pretzels. The kids picked out the Reese’s of course. What do you think would be your favorite ingredient? 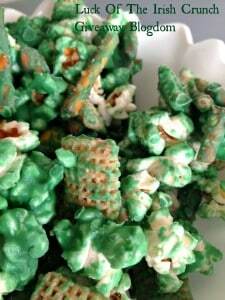 Love the St Patrick’s Day Crunch Mix and your link up. I see that it is over but I would LOVE for you to add it to my linky so you can still get traffic to it! You had me at hello with this recipe! Hope you can stop by the enchanted oven for a visit. This definitely looks like a great movie night snack! I love fun holiday treats! Thanks so much for sharing. It’s been pinned. Have a wonderful day! Thank you for stopping by. This recipe is so easily adaptable for any holiday! I’d pick the popcorn as my favorite! I love colored popcorn but wouldn’t have thought about adding Chex! Mine would DEFINITELY be the Reese’s Pieces – they’re my favorite! Love a snack/recipe that you can easily adapt to different Holidays and Parties! That is such a cute idea! I already have almost all the ingredients because I made my own Chex Mix last week, I just need the M&Ms and the candy melts. I think I’ll try to make it this week! I love how easy and versatile it is, pretty much anything you have on hand will work. I would love to hear how you liked it once you get it made. Thank you for stopping by! I soooo need to make some of this. I’ve been craving a salty/sweet combo and this sounds perfect 🙂 It’s pinned to my Holiday Recipes board for St. Patrick’s Day stuff! I can’t wait to hear more about your farm! I grew up on a farm and still love all things farm-y. What kind of farm did you grow up on? We grow potatoes and barley currently. Three generations so far with the fourth loving it more and more everyday! I’m looking forward to hearing more about your farm life! Brandy I love your recipes soooo much! This one is just as amazing as your last one! Thank you! I am loving sharing them with everyone. Let’s face it I cook 21 meals a week why not share them. Thank you for stopping by! I was thinking about making some of this last weekend. 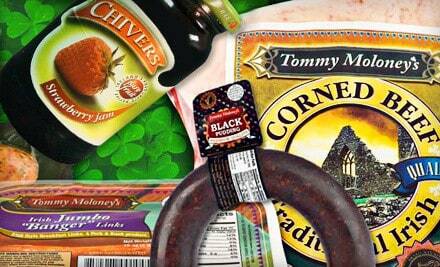 It looks so good when packed in small green bags for St. Patricks Day. My family is in love with the taste of it as well. The flavors just blend so well together. It will be around for all of our holidays I guarantee. Thank you for stopping by Pam.